Nei Paruppu is a famous dish in Kongunadu Cuisine. It is also called as Uppu Paruppu, Mudha Pappu. It is a simple curry with a mild taste. Normally they feed nei-paruppu to kids (below 1 year) with lots of ghee and simple vegetable. 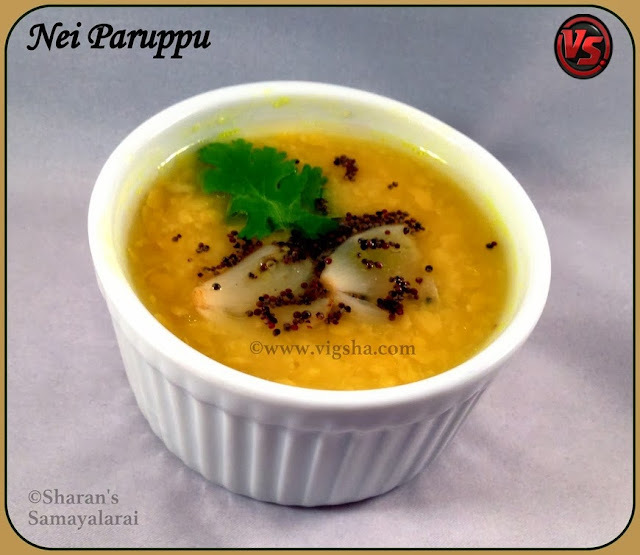 In a typical Kongunadu meal, Nei-paruppu is served first followed by Poriyal(stir-fry), Vadagam, Kootu, kuzhambu, sambar, rasam, curd and pickle varieties. It makes a delectable spread. 1). Wash dhal and pressure cook with castor oil. Pressure cook them soft until 3-4 whistles or alternatively use an earthenware pot to cook the dal. 2). When pressure is released, mash the cooked dhal. Add the crushed garlic and salt, combine well. Garnish with coriander leaves. Serve with a dallop of ghee, steamed rice and Bendakkai Kuzhambu. Enjoy this complementing combo !! # Toor dal needs more whistles to cook than other dal types. # The consistency should be semi-thick. Dilute it by adding water if you want the consistency to be little watery. # This dal is plain and simple, it doesn't need any seasoning. # Ghee is must for this recipe, don't skip it or you will spoil the taste. # Add more water while cooking dal and strain it after cooking. Use this water to prepare Paruppu Rasam.